It’s light and moist, not too sweet, spiced with cinnamon and loaded with chopped walnuts and chunks of apples. There’s not much to add to my monologue today! I had this recipe for so long and never changed a thing in it. I just love it! The only thing I recommend is that to make sure that your walnuts are fresh, cause old ones might ruin the whole taste of your cake. And this is how I make it! 2. In a large mixing bowl, combine sugar and oil. Beat in eggs and vanilla with a wooden spoon. 3. Into another bowl sift flour, baking soda, baking powder, and cinnamon. 4. Stir into egg mixture alternating with milk. Stir in apples, chopped walnuts, and raisins. 5. Spoon batter into prepared pan. Bake at 350° for about 45 minutes, until cake springs back when gently pressed with finger. 6. Let cool in pan on rack. 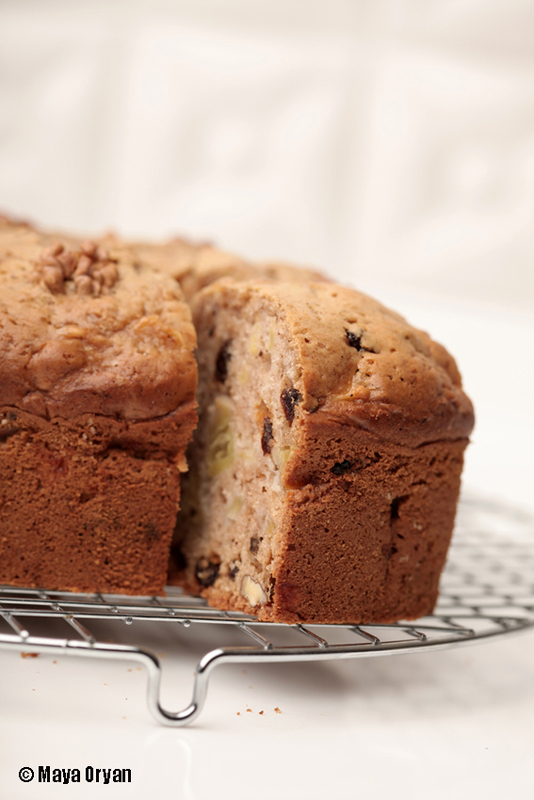 This entry was posted in Desserts, Recipes and tagged Apple walnut and raisins cake, Apple Walnut Cake, Cake, Food Styling, Food Stylist, Maya Oryan, Spicy cake by Maya Oryan. Bookmark the permalink. it is one of my favorite cakes too. welcome home, sis. i hope you enjoyed your trip. Can’t wait to see you and the girls! Yummy! I made my own version of this a while ago and blogged it. It went down very well – it had a delicious black treacle icing. This looks wonderful! I shall have to try your version. I remember seeing it on your page:) Really POSH with the icing! is it powder mild or liquid milk? Liquid milk! Skimmed, low fat or full fat, all 3 works. If you want to use powder milk use 120ml of water and 4 tbsp of milk. P.S. It might take longer than 45minutes, it depends on your cooker. Hello! Thanks Mitesh for the boost:) You can either use melted margarine (like FLORA) or corn oil. Bon Appetit!